Nobody wishes to have their app developed and get them hidden. Rather people try to display it or even promote it that their users could find them. Making it visible to your audience involves a lot of effort these days. They can either be organic or artificial. Improving app visibility artificially may be simple and fruitful for a few days, but organic results last forever. 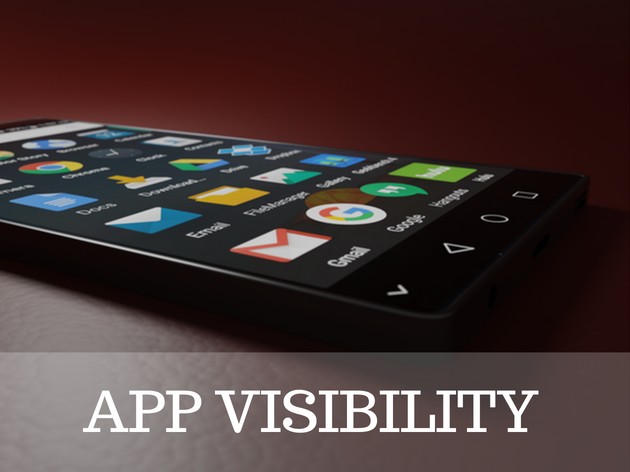 In this post, let’s see some of the best ways to improve app visibility among users. The following techniques are literally tested and proven to be result oriented ones. Ratings are the most valuable thing that every user expect before he/she could download the app from the app store. It is because every user wants to know how the product performs. A review from the existing user could help it in a better way. Most businesses do not consider it more important as they think reviews are no way a benefit to their business. But the fact is your app review could play a lot better than what you expect. Businesses fear reviews because of the negative comments that they might obtain. In reality, we do not neglect chocolates because of the poor quality brands. Rather, we prefer high-quality brands. The same is applicable when it comes to reviews. It is something hard to rethink the entire process, rather you could make use of the opportunity to trigger them to post in positive reviews. If you are application is a game, you can offer your customers reward points. These rewards motivate them to add a review to your apps. If your application something different you can make use of the strategy but with some different rewards. Have you come across a “Rate our app” pop up when you install an app from the store? You definitely would have. Many of us ignore it. But this is a real way of improving your app visibility. You can allow your new users to identify your app and how good it performs by following this technique. Apple introduced an app review method in 2014 and that became the best way for users to review a product before their purchase or usage. So by using this technique, you can allow your customers to completely recognize how your app works. This improves trust on the product that you launch. On the other hand, people suggest their friends about the products that they have already experienced good out of it. In case, if the customer is not satisfied they neglect the product. So it is good to share your product with your customer that they find it more comfortable to decide on the product or app. It checks your confronts. The foremost question that rises about your applications is, “how is it performing among your customers?” Most of us are so much eager to know the performance of our product and that is why we happen to check them with the help of analytical tools. These tools are not just meant to check the interaction of the product or app, it also helps you find what type of audience are interested in downloading your app, what are the expectations of your audience? On what basis they download your app? which age category shows more interest in downloading the app? and many other queries falls under this category. With the help of an analytical tool, you will be able to analyze all the above-mentioned queries and that may help you to confirm whether your app serves all these requirements of your targetted audience. By this, you will be able to meet around 20% of your audience’s requirements and come up with a product that completely satisfies them. Further, you can compare it along with your competitive apps to enhance the performance of your application that it may excel in the competition and conquer the visibility of the audience. This is something really more important. Many businesses assume that boarding their application on the store is more than enough. They think the description and the review column has a lot to do with the app and its visibility among the customers. The assumption is not going work. It is really important to have a website and a banner for your application. A recent analysis has stated that a website is an online hub for an app and it can help customers to approach the website in case if they have any queries about the app. The app website should completely have the description of the app, screenshots and complete review video of the app. This helps your user to visit the website on any doubts. You can even give away the latest update of the application on your website. This may add some more credibility to your application and your business. For example: Hope you have come across Apple’s smartwatch banner, this helped the company to publicize not only the product but also its functionalities and other stuff about the watch. The same technique is recommended for a better investment in the product. Have your heard viral circle? It is for the most part a promoting strategy to welcome your application clients to end up its advertisers. I wager you’ve found out about viral recordings on the web, which means everyone was discussing them. Be that as it may, an indispensable circle is more confused, let me clarify. Welcome your application clients to end up its advertisers. When you publicize your application, your displaying materials use phrases like “Please download the application here,” “Look no further, download yourappname here,” and so forth. This is positively not a viral promoting. If your application is setting off a reaction from customers like, “This is to a great degree cool application, so I better prescribe it to my friends!”, this would be viral yet not a viral circle. Regardless, if your application customers understand that by sharing your application they improve their own particular association, this is a viral circle. P2 – the extent of dynamic clients who welcome other individuals. In light of the qualities for N, P1, and P2, VC can be either more than 1, equivalent to 0 or under 1. On the off chance that your application’s Viral Coefficient is more than 1, arrange a gathering—your application is really turning into a web sensation! In the event that it’s equivalent to zero, you’re in a bad position, there is no popular circle occurring. Return to the planning phase and see what you should change in your viral methodology. Presently, if it’s short of what one, remarket your substance, and screen the circumstance intently. Here is the manner by which you can actualize a viral circle. You should get ready for your application improvement organize. Fundamentally, you can pick one of the three noteworthy approaches to make a viral circle without gambling a dismissal by Apple. Plan your application’s viral circle in the improvement structure. This is the way that works the best for recreations, and it has very basic structure. After clients introduce your amusement, they accomplish some level in the diversion and get a specific score. At that point they send their own records to her companions and test them to beat it. Their companions get a pop-up message on their cell phones or tablets and endeavor to address the difficulty. As you may figure, these companions will take after a similar way and test different companions. By and by, this procedure works extremely well for diversions. This time as opposed to testing others, you make a barricade in your diversion or a troublesome level. At that point you give players the alternative to request assistance from companions. This technique works for any sort of application. You set up a line for individuals to get your application ahead of time of your application discharge. At that point you give them an alternative to bounce up in the line on the off chance that they share their line number and a message about the application on their online networking channels. This is a basic and exquisite approach to get the message out about your application before its discharge and get natural downloads. Allowed this technique will work just for brilliant applications. Look at to perceive how this procedure worked out for well known Mailbox application. Making a viral circle enables you to develop your client base in a brief time frame and spares cash on costly CPI crusades by getting downloads for nothing. Ensure you track KPIs inside the application and each internet based life channel you’ll be utilizing to perceive what particular message or picture drives the most commitment. If you have planned to build an application for your business, you should definitely plan for its visibility among your customers and in order to help you out at such circumstances, we have introduced a few techniques that are essential for your app’s visibility. In case, if you have already developed an application and found that there is no user interaction, you should definitely follow these strategies to make your application viral among your customers. Never miss one as these strategies are proven to be the best one to improve user interaction.